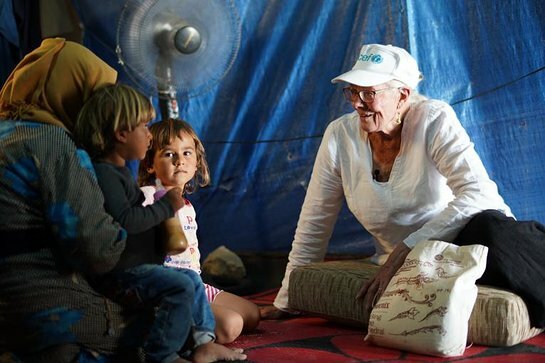 UNICEF Goodwill Ambassador and renowned actress Vanessa Redgrave, met with Syrian, Palestinian and Lebanese children and youth in Lebanon during a two-day visit to the country this week. Vanessa visited projects implemented in and around Bednayel in the Bekaa Valley by Lebanese NGO LOST (Lebanese Organisation for Studies and Training), a UNICEF youth partner organisation which runs education programmes aimed at empowering vulnerable Lebanese and Syrian youth. She spoke to the children and young people about the obstacles they face in their daily lives, in obtaining an education, and finding jobs and opportunities. She also visited Housh al Rafiqa informal settlement, where spent time with Syrian refugee families including the Al Salameh family, and heard about the challenges their children face in accessing education, and the Hamdou family – a mother and nine children – discussing the struggles the family face in terms of supporting themselves. Vanessa also visited Shatila Palestinian camp, where she returned to a project close to her heart and spent time with the children, teachers and staff at the Beit Atfal Assomoud Kindergarten. In Ghobeiry, Vanessa visited the ANERA centre, meeting Lebanese, Palestinian and Syrian young people taking vocational training courses, including hospitality management and beauty care. Vanessa then met young children taking part in basic literacy and numeracy and early childhood development programmes run by the Lebanese NGO Ana Aqraa. “In Lebanon, UNICEF is working alongside UNRWA and Lebanese NGOs for the Syrian and Palestinian children, but also for the vulnerable Lebanese children. The support we provide for these agencies, these teachers and children are so vital for the future, for their future and for ours,” Vanessa added. Lebanon, which has the world’s highest per capita refugee population, has been particularly affected by an influx of more than 1 million Syrian refugees. This is equivalent to nearly one-quarter of the country’s total population before the Syrian conflict began. The surge has taxed local resources, particularly schools, and has affected both refugee children and Lebanese students. “Education is not a privilege or a gift; it is a right for every girl and boy. That’s why UNICEF is equipping Lebanese, Syrian and Palestinian children and youth with skills and knowledge to fully realize their potential, therefore empowering them to overcome the challenges of life” said Tanya Chapuisat, UNICEF Representative in Lebanon. Redgrave’s visit to Lebanon came as UNICEF released a report highlighting that a third of children and young people between the ages of 5 and 17 living in countries affected by conflict or disaster – totalling 104 million – are not in school. In Syria, after more than seven years of war, more than half of children at secondary education level are out of school. For children living in countries affected by protracted conflicts and complex humanitarian emergencies, quality education is particularly critical as it provides them with the stability and structure required to cope with the trauma they have experienced, and equips them with the knowledge and skills they need to rebuild their country once the conflict or disaster is over. Since 2015, UNICEF has been promoting free access to quality education for all children in Lebanon. With UNICEF support, the 2017-2018 school year has witnessed an increase in student enrolment rates by 14 per cent among non-Lebanese children and 3% among Lebanese children compared to the previous school year. Despite these efforts, many children remain out of school. More needs to be done to reach children who are not enrolled in any kind of education.